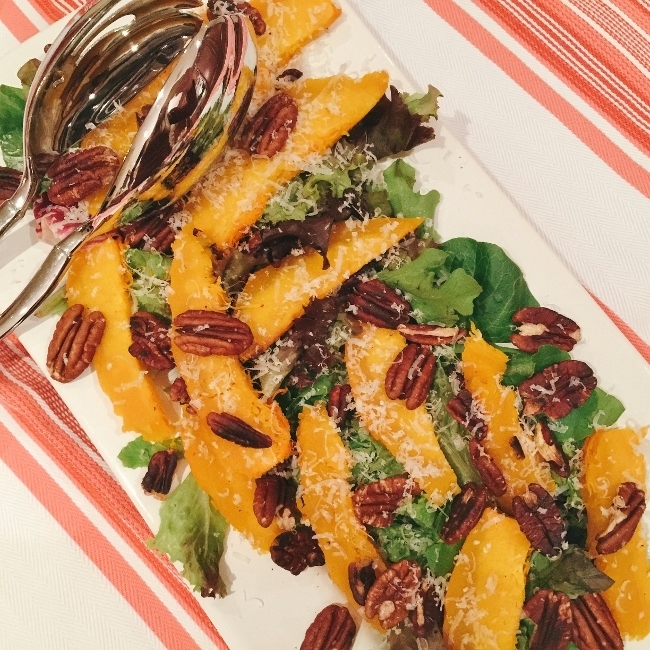 Pumpkin Pecan Salad - Recipe! - Live. Love. Laugh. Food. Fresh pumpkin is lovely roasted and eaten as a vegetable, and sometimes overshadowed by the traditional pumpkin desserts we often eat like; pies, cakes and cookies. Roasted pumpkin caramelizes nicely at a high temperature in the oven and is delightful tossed with grains or greens, or stirred into soups or risotto. The savoriness of pumpkin often highlights other vegetables, especially winter greens. Roasted pumpkin has a nice texture – a mild creaminess that contrasts salad bitters beautifully. The toasted pecans are definitely autumnally fragrant and provide the crunch that every great salad desires. As for the vinaigrette – a simple preparation shakin’ in a jar and served along side the salad. These flavors of fall make this salad a seasonal favorite and divine to serve during the week for dinner, or for the upcoming holidays. 1. Preheat oven to 425 degrees. Seed and slice pumpkin in half and place on a sheet pan. Drizzle with a olive oil and rub over pumpkin. Roast in the oven for 45 minutes. Remove from oven and let cool to room temperature, about 1 hour. 2. In a small jar with fitted lid, shake vinaigrette ingredients and set aside. 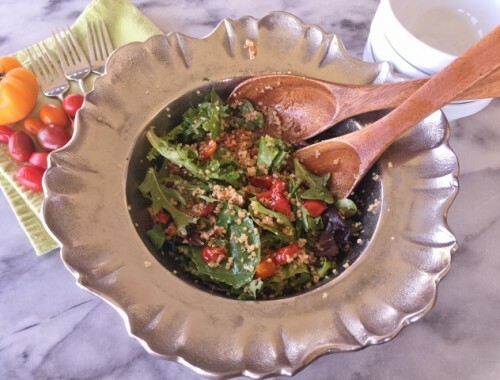 Assemble salad by placing greens on bottom of a platter or salad bowl. 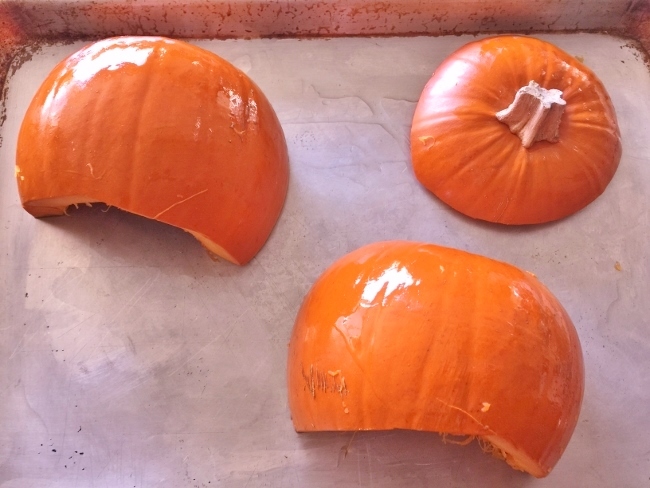 Gently remove pumpkin skin around perimeter with a knife and slice thinly. Place slices on top of greens. Toss toasted pecans over top and sprinkle with Parmesan cheese. Serve with vinaigrette, Enjoy! 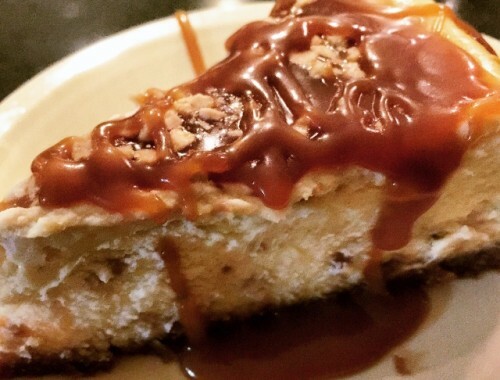 Toffee Cheesecake Recipe! Celebration is in Order! 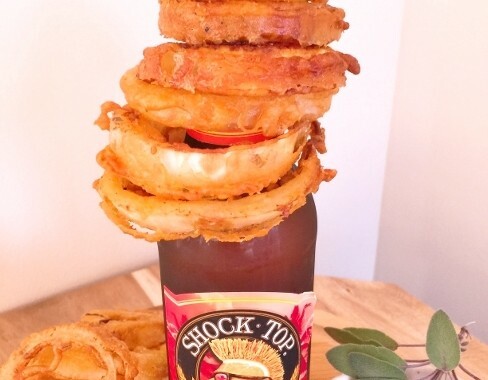 Beer & Sage Battered Onion Rings with Maple Sriracha Sauce – Recipe!